Wow, who tears their stamp room apart a month before the holidays!!! Of course, that would be me, the reason I haven't blogged in so many days!!! It is a disaster, but, I am rearranging and cleaning out, so it will be an ongoing project for awhile. Today's card is for the challenge at Squigglefly (SFC4512). The name of the digi is Christmas Delivery, by Artist Lynne Stansbery. The theme at Squigglefly is Oldie but Goodie. Ha ha...I've done the same thing in my closet! We're both a bit crazy, it seems :) Adorable card, Sue - love the brightness of your colors, and what a sweet image - thanks for sharing! 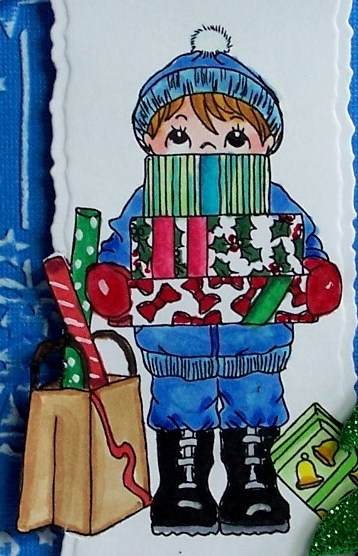 What a wonderful and adorable card - and the image is colored perfectly. Thanks for joining us at Squigglefly this week. Sue, this is cute as can be. Great job on the image and I love that Nordic Snowflake border. I'll have to see about adding that one to my wish list. I know what you mean about starting cleaning projects at the wrong time, I do the same thing myself. Kisses to Keeya for me. Does she have her cone off yet? I Hope so. enjoy your weekend and don't work too hard. Gosh sue your coloring on this is fantastic. there is such a wonderful dimension to it. 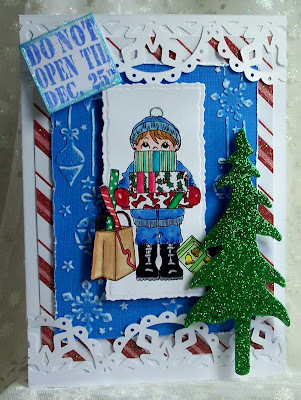 I love your snowflake trim border and the "do not open" sentiment is perfect! The glittered tree and candy cane striped paper adds so much! thanks for playing in Squigglefly's challenge this week! Good luck on your craft room organization and clean up! Such a cute card! What a little sweety with his eyes peering up. Beautiful border, die cut sparkly tree and embossing too. Love the effect of the sanding. ooooo he is cute and beautiful christmas card Sue. What a delight card Sue and just perfect for this week's challenge. I love the stamp you chose! I can't wait to see more wonderful creations from you. Thanks for playing with us at Squigglefly! Well I wish I would take a turn at cleaning my space, it does need it, but I do think I will wait till after the holidays:O) Love your card with the old fashioned boy and his load of gifts, wonderfully coloured and designed!! There you are again with such cleverness -- sizzix on sparkle foam -- you have made a WOW card.